Discover why so many customers in Norfolk, Suffolk and London trust us to make beautiful cabinetry for their homes. We showcase a range of finishing touches to inspire your new kitchen. 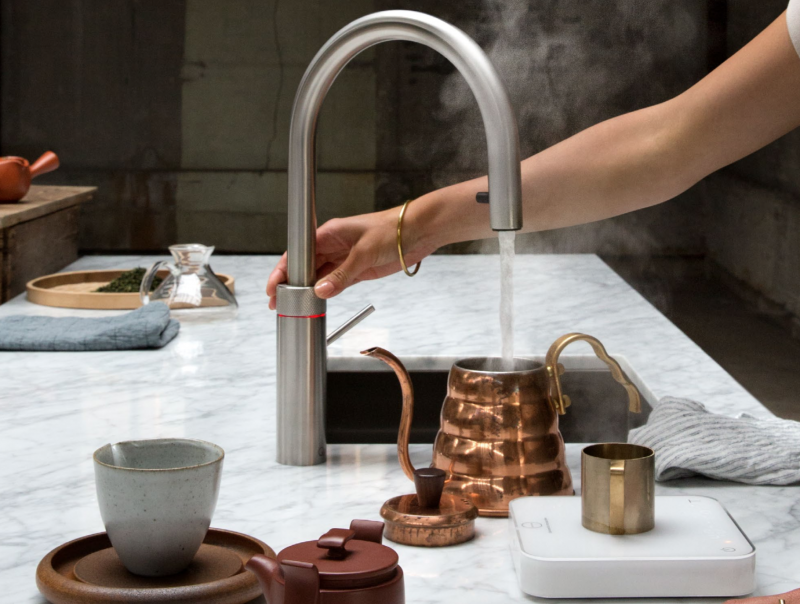 Quooker is the original boiling water tap. It started as a simple idea back in 1970 by one man and is now making the lives of hundreds and thousands worldwide run a little bit easier. OK. It’s not every day that something as dull as running a tap gets a pulse racing. But with a Quooker in your home, giving you access to 100 degree boiling water quicker than you thought possible, frankly it’s now something to get excited about. At Anglia Kitchens and Bedrooms, we’re seeing more and more customers specify this appliance when they order a new kitchen. It’s the kind of tap that combines the beautiful and the useful so perfectly, it would make William Morris weep cold, warm, hot and boiling tears of joy at any one of the eleven models or a variety of finishes you can choose from. It’s a really simple idea. A tap and a tank. The tap sits on your sink and the compact tank with its patented technology fits discreetly either under your worktop or in a kitchen cupboard, connected to the water mains. With three tanks available, their A energy rated Combi is the first ‘boiler’ with high vacuum insulation ensuring that heat can’t escape in storage, making it the most energy efficient hot and boiling water provision for the kitchen. With all models, the water actually starts to boil when the tap is turned on. As the water passes through an active carbon filter in the tank, it’s instantaneously cooled to 100 degrees, delivering great-tasting, boiling water with the twist-and-turn of a tap. Just think of all those minutes you can win back never having to wait for water to boil! A quick cup of tea really can be a quick cup of tea. Wave goodbye to impatient drumming fingertips on worktops waiting for the kettle to boil. In fact, say hello lovely clear worktop! How beautifully uninterrupted by a kettle and a tangly cord you are and how lovely to see you so free from clutter! Along with saving you time, a Quooker tap can prevent you unnecessarily wasting water. You won’t have to boil more water than the amount that you actually need. And you certainly won’t have to let the tap run for a while until the water heats up. Safety, of course, is Quooker’s number one priority. The childproof handle, insulated spout and warning light indicating when boiling water is being used are key standard safety features on all of the models. In addition to this, the flow of the water is delivered as an aerated spray, not a solid jet, which prevents the risk of serious scalds or burns. 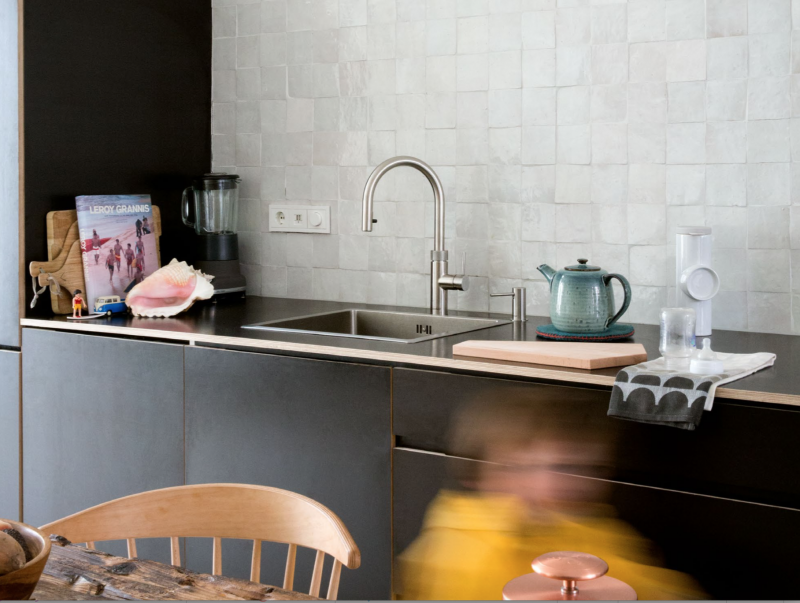 And with no kettle to knock over or pan of water to pull off the stove, a Quooker tap really is the super-safe option for busy households and small helping hands. So, after all of this, is it fad or fab? Well, Quooker is the original boiling water tap. It started as a simple idea back in 1970 by one man and is now making the lives of hundreds and thousands worldwide run a little bit easier. Sure, there are now others joining the market, but if you’re going to invest in something that will enhance your everyday life, we’d definitely go with the flow and choose Quooker. Even better is that we’re offering free fitting* with the purchase of a new kitchen, making it more affordable than ever! Get in touch if you’d like any further information.